This was a super quick order that just had to be made right now! After searching the local fabric stores I came up empty handed with the fabrics Belinda had in mind. So as to not lose any time with postage from online stores, Belinda insisted she get them herself ASAP and then sent them express post to me. Great choices Belinda. Would you believe it is hard to find this deep red spotty fabric used on the doors. Why isn’t it everywhere. It’s such a basic fabric that is just needed all the time. And isn’t the trim fabric she chose just soooo cute! With little images of quaint houses and flowers and the Eiffel Tower it worked so well for the bunting flags. Do you love Belinda’s choices too? 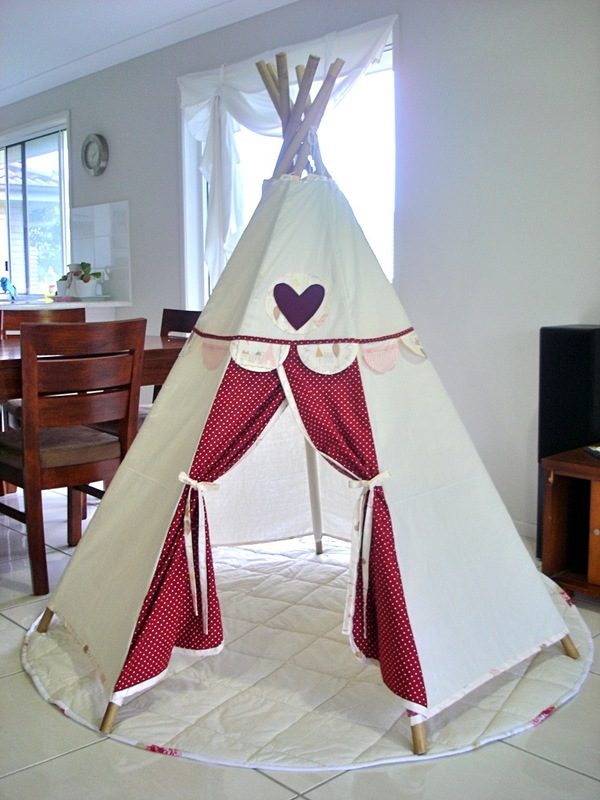 What colours would you choose for your teepee?